The Devastator (ターミネーター, Tāminētā?, lit. "Terminator") is an Emblem Heartless that is found in Kingdom Hearts II. One of the strongest normal enemies in the game, the Devastator is a massive, computerized Heartless. It can be found in Space Paranoids, although there are a few instances in which it has appeared in the Radiant Garden, such as when the Master Control Program takes control of the Heartless Manufactory. 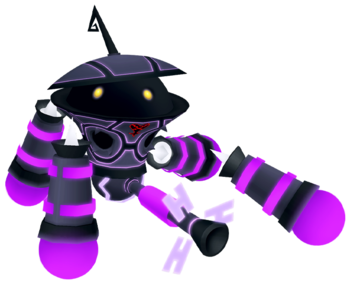 A more powerful version of this Heartless, called the Reckless, appears in the Cavern of Remembrance in Kingdom Hearts II Final Mix. When Sora is forced to participate in a Light Cycle race, a Devastator misses a shot and creates a hole in the wall, which Sora uses to escape. The Devastator is a mechanical Heartless that has large, spherical, black head with glowing yellow eyes encased in a funnel-shaped suit of armor. It has a flat helmet with a jagged, black antenna on its top. At the base of the funnel is a large turret with a violet shaft and a black tip. Three lavender, H-shaped pieces float around the tip of the cannon. It also has four cylindrical "legs". None of these legs are directly connected to the Heartless, and instead levitate around it. The Heartless has two forms. One is a tank-like, ground-based one in which it walks along the ground using its legs for locomotion and its turret for attacks. The other is a levitating, aerial one that uses its legs to bludgeon opponents and seems to use its turret to remain floating. The Devastator is predominantly black and covered in violet computer circuitry. Its Heartless emblem is on its front, just under the rim of the funnel. The Devastator's name is derived from the word "devastate", which means "to destroy" or "to ruin". This reflects the Heartless's great power. Its Japanese name, "Terminator", holds a similar meaning, as "terminate" means "to kill" or "to end". The Devastator is a quite difficult opponent due to its many strong attacks. It has many long-range and short-range attacks. It can fire homing shots from afar, which can be deflected with Guard, but it is rather dangerous. The best bet would be any form of Reflect magic. The Devastator attacks in a distinct pattern. They have two forms: an aerial form for close combat, and a ground-based tank form that blasts energy at targets from a distance. While changing forms, they release powerful electric shocks, which will harm Sora's party if they are nearby during the transition. Stay back during the transformations, then blast them with magic or use strong Keyblade combos. The Devastator's Aerial Combat form.